There is no better word to describe the Coromandel region than unique. Aside from the obvious attractions that the tourists flock to, the area hides heaps of tiny beaches and rainforest walks that are worth discovering in true backpacker style. Unsurprisingly, the whole area is a magnet for working holidaymakers. Just by looking at pictures of Coromandel, who wouldn’t want to spend most of their gap year in a paradise like this? 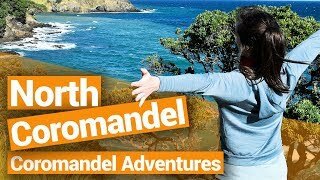 For an in-depth guide to the peninsula, read our Coromandel – Guide for Backpackers or for a cheap place to stay, see our 5 Best Backpacker Hostels in The Coromandel. Remote beaches scatter the region, many of which can only be found by following a long walk through the bush. It’s well worth the exercise to emerge onto an often isolated beach. Sunbathe on the golden sand or delve in the turquoise waters: this time is yours, so treat yourself! Our personal favourite, New Chums Beach, is pictured below. 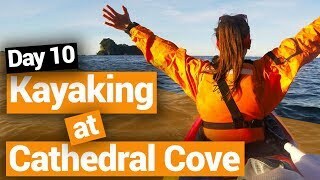 Amongst all the isolated beaches, one stands out: Cathedral Cove. The beach is home to impressive rock formations that were featured in the blockbuster series The Chronicles of Narnia. Although you will never be alone on the beach, as this is a tourist hotspot, the gigantic arch cavern is a must-see in the area. Less popular than the famous Raglan, Piha and Kaikoura, The Coromandel has a few hidden gems. And with over 400km of coastline on the peninsula, why wouldn’t it?! The beaches around Whangamata and Pauanui are your best bet for a good surf, but you can also take your board and hunt for a great Pacific swell at any beach you like. It is hard to retreat from the shores of the Coromandel but the Pinnacles, located in the imposing Kauaeranga Valley, is a great way to do so. The walk to the Pinnacles is one of the most popular in the area. If you plan on staying overnight in the DOC hut along the path, book it well in advance to secure a spot. Check out 16 Awesome Hikes in The Coromandel for more information. “Unique” does not even begin to state how rare Hot Water Beach is. 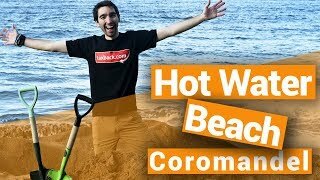 Within two hours either side of the tide you can dig yourself a pool where extremely hot water will sprouts from the ground. When the cold sea water come into your pool it adjusts the temperature. Then you can relax in you homemade hot pool. Check out 15 Coromandel Must-Dos for more attractions like this. New Zealand likes BIG things and the L&P bottle in Paeroa, on the foot of the Coromandel peninsula, is one of the most famous. No doubt you will pass the town where the New Zealand soft drink originated, so take a quick pit stop to get a touristy photo with the bottle. Big Bay’s Blow Hole has the “WOW” effect on anyone that sees it. The underground cavern plunges 25 metres under the forest. Don’t forget your camera, you’ll only have one chance to get a picture like this one, especially as it is only accessible by boat from Hahei and when the tide is low. Every summer, Arctic birds come to New Zealand to escape the Northern Hemisphere’s cold winter. Most of those birds choose to settle near the rich ocean waters of the Coromandel offering a truly spectacular sight to any wildlife lover. The area has a rich mining history and the best testament of that is the Karangahake Gorge. Old goldmines, tunnels and caves are linked in every way by a system of suspension bridges and walking tracks. Read more about the gorge on our Coromandel – Guide for Backpackers. Being on the east coast of the country, the Coromandel is blessed with daily spectacles. It’s definitely worth getting up early, tying up your hiking boots, and walking to one of the east coast beaches to watch the day begin (or west to watch it end).